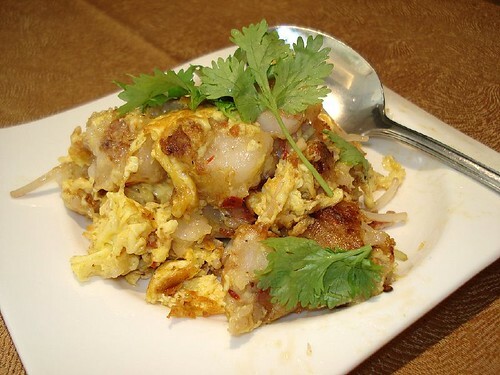 Carrot cake with XO sauce and beansprouts, originally uploaded by Camemberu. Another nice family outing, this time to Asia Grand which has taken over Chef Chan's spot at Odeon Towers. This Cantonese restaurant, formerly at Scotts Road, has gained quite a reputation for its Peking duck in particular. The carrot cake with XO sauce, chili and beansprouts (S$7) was a nice opener. Very tasty. Mother-in-law said if they served something as tasty as this at the hawker centre downstairs, she would buy it every day. 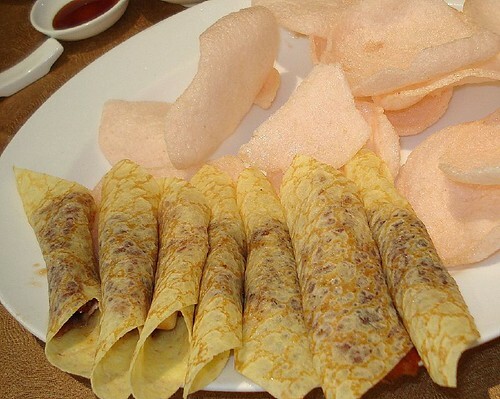 Peking duck - first half portion, with prawn crackers, originally uploaded by Camemberu. This is what we came for. The Peking duck (currently on promotion, S$28 per bird) is done to rave reviews and certainly is one of the best I've had. The minute I bit into one, I wanted to come back another day and eat it again. Crisp duck skin with just enough fat (not too much) wrapped in thin, soft crepes with scallions and cucumber. Lovely plum sauce that thankfully isn't overpowering. And a bonus of pink prawn crackers - Nadine loved these! Delicious sambal chili and some fishcake-capsicum salad appetiser, originally uploaded by Camemberu. 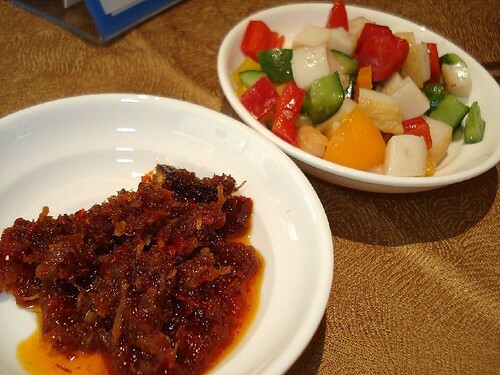 This is the first time I've seen an anchovy-based sambal chili accompaniment in a Cantonese restaurant. It tasted delicious on its own but hubby didn't think it went well with the traditional Chinese dishes. I liked it anyhow. The ubiquitous "pickles" (you get charged S$3 for this) were oddly an assortment of diced capsicum and cucumber with fishcake. Garoupa done two ways, originally uploaded by Camemberu. This is called having the best of both worlds. Garoupa done both ways (S$28). 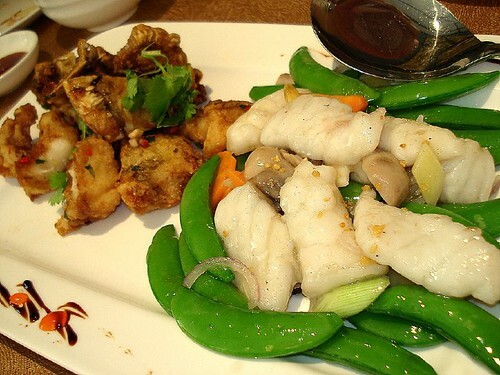 Lovely, tender, thick slices of boneless garoupa stir-fried with sugar snap peas, carrots, straw mushrooms and onions. The other half is well-seasoned, deep-fried pieces - these came with skin, and unfortunately, bones as well. 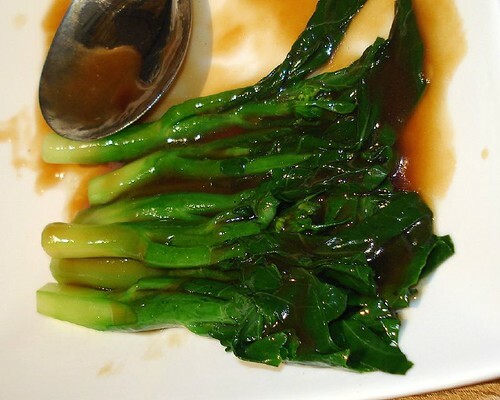 Hong Kong kai lan with oyster sauce , originally uploaded by Camemberu. 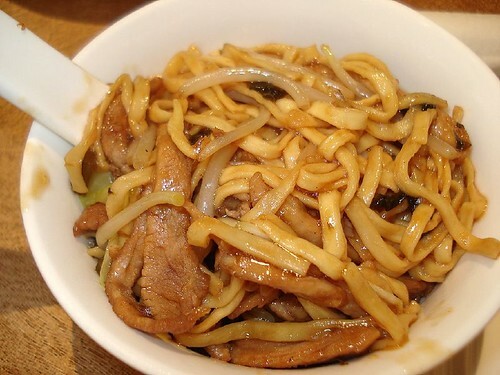 Peking duck meat stir-fried with ee-fu noodles, originally uploaded by Camemberu. The remaining meat from the Peking duck we requested to be stir-fried with ee-fu noodles (S$10). It was a large portion served with red vinegar on the side. Not bad but not the best I've had. The meat was fairly gamey - I didn't mind so much but I think the rest of the table did. Well, no matter, more noodles for me! 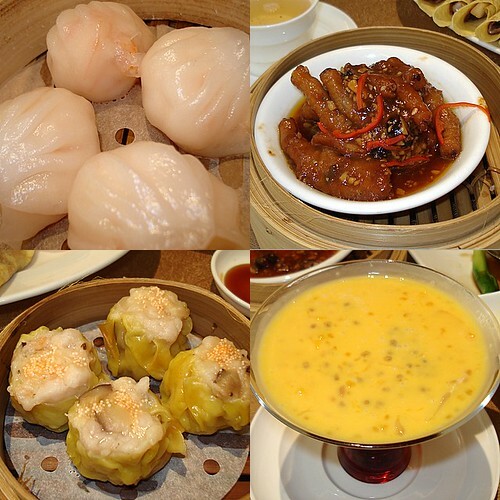 Dim sum and dessert (mango pomelo sago), originally uploaded by Camemberu. We also tried some of their dim sum (S$3-4). Regular har kow (shrimp dumplings), siew mai (pork dumplings) and chicken feet. All competently done but nothing outstanding. Dessert was cold pomelo mango sago (S$5) - very nice, creamy and thick. Service is friendly, decor adequately posh but the atmosphere is kept casual enough. The food is all right, just slightly above average - the Peking duck is really the highlight. I wonder if I can come back on my own someday to eat just that...mmmh!